Bambara is the most widely spoken language in Mali / West Africa. 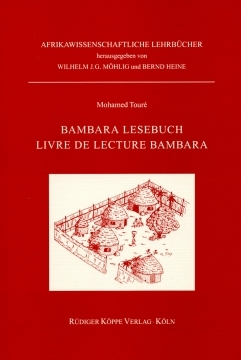 This reader is intended for students with some basic knowledge of Bambara, as well as offering an introduction to the geography and history of Mali, the customs and traditions of its inhabitants to the interested general reader. The history of Mali. The geography of Mali. The foundation of Bamako. The Tabasci holiday. Meals in Mali. Bamako – capital of Mali. Sunjata Keita. The Griots. Our estate. A wedding in Mali. Baptism and circumcision. Timbuktu. Song texts and tongue-twisters. Glossary Bambara – German – French.